Gaza authorities arrested five Palestinians on Saturday on suspicion of ransacking the offices of President Mahmoud Abbas’s official Palestine Television station, Reuters reports the Hamas interior ministry as saying. The incident underscored tensions between Abbas’s Western-backed Palestinian Authority, based in the occupied West Bank, and Hamas, the group that rules Gaza. But Hamas on Saturday said all five suspects men were former employees of the Palestinian Authority, whose salaries were recently suspended. There was no immediate response from the Palestinian Authority. There has long been antipathy between Hamas, which won the last Palestinian parliamentary elections in 2006 and is opposed to any peace negotiations with Israel, and with Abbas’s more moderate and secular Fatah faction. 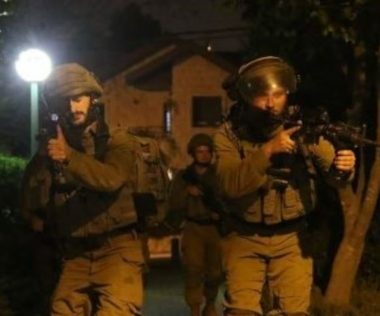 A Palestinian youth was seriously injured in an Israeli raid in the West Bank city of Al-Bireh on Sunday, according to the Health Ministry. Israeli forces raided the city and searched a number of houses and shops, triggering clashes with local residents. Witnesses said Israeli forces used live ammunition, teargas and rubber bullets to disperse stone-throwing Palestinians, who responded by setting tyres on fire. 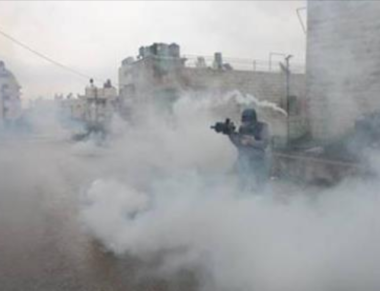 One Palestinian was seriously injured in the clashes, the Health Ministry said in a statement. Witnesses said Israeli forces confiscated recordings of surveillance cameras before withdrawing from the area. The Israeli military has yet to issue an official statement on the raid. Settler attacks against the Palestinians in the occupied West Bank tripled in 2018, Israeli newspaper Haaretz reported on Sunday. Israeli settlers carried out at least 482 attacks against Palestinians last year, up from only 140 in 2017, the daily said. The settler attacks ranged from “beating up and throwing stones at Palestinians, painting nationalist and anti-Arab or anti-Muslim slogans, damaging homes and cars to cutting down trees belonging to Palestinian farmers”. In July of 2015, Israeli settlers torched the Dawabsheh family’s West Bank home in an attack that claimed the lives of two Palestinians and their 18-month-old baby. Their eldest son, Ahmed, 6, survived the attack, but suffered severe burns that have affected his mobility. The incident sparked international outrage at the time, with the Dawabsheh family accusing Israel of dragging its feet in prosecuting the suspects despite admissions by Israeli officials that they knew who was responsible. OCCUPIED JERUSALEM, PALESTINOW.COM — The Supreme Muslim Council in Jerusalem on Saturday said that the Adhan (call for prayer) is a Muslim ritual and those “annoyed” by it can leave the city. The council said in a statement that despite the Israeli Knesset’s failure to issue a final decision on the Adhan in Jerusalem in particular and in the occupied Palestinian territories in general, Israel has never stopped searching for a way to silence Muslims’ call for prayer. According to the statement, the head of the Israeli-controlled Jerusalem municipality has recently initiated a proposal to place a limit on the volume of loudspeakers calling for prayer in Jerusalem. The council stressed that the Adhan is an important ritual that is linked to one of the major pillars of Islam, prayer, noting that the Adhan has never been silenced in Jerusalem and Palestine over the past 15 centuries. Adhan is an Islamic ritual recited five times a day to invite Muslims to perform their religious prayers. It was first chanted by Bilal, the Companion of Prophet Mohamed, centuries ago. GAZA, PALESTINOW.COM — Palestinian group Fatah announced Friday the closure of all its offices in the Gaza Strip over security concerns. Citing alleged recent incidents where the group’s officials had been arrested and threatened in the enclave, Fatah’s Gaza spokesman Atef Abu Yusuf told Anadolu Agency that all offices had been ordered shut until further notice. Earlier on Friday, masked assailants raided the headquarters of the Palestinian Broadcasting Corporation in Gaza City, leaving staff injured and equipment destroyed. The Hamas-led government condemned the attack, calling for its perpetrators to be arrested. Fatah spokesman Atef Abu Seif had on Monday issued a statement alleging that Hamas had arrested over 500 of the group’s members — including some senior officials — ahead of a rally marking the 54th anniversary of the movement’s founding. The Hamas-run Interior Ministry denied the allegations, saying only 38 people had been summoned for questioning, with all of them being subsequently released. Hamas and Fatah have been at odds since Hamas seized control of Gaza in 2007 from Fatah after street fighting. Last month, delegations from the two rival groups held talks with Egyptian officials in Cairo with a view to ending the inter-Palestinian division. The talks were one of dozens of rounds in Cairo and several Arab capitals between Hamas and Fatah since the start of the rift in 2007, but they have yet to bear fruit. Israeli soldiers shot and seriously injured, on Sunday morning, a young Palestinian man, after several army vehicles invaded the al-Biereh city, in the Ramallah and al-Biereh Governorate, in central West Bank. Palestinian medical sources said the soldiers shot the young man with a rubber-coated steel bullet in his head, causing a fracture in his skull and a brain hemorrhage. The Palestinian was instantly rushed to a hospital, where he was admitted to surgery, and remains in a critical condition. 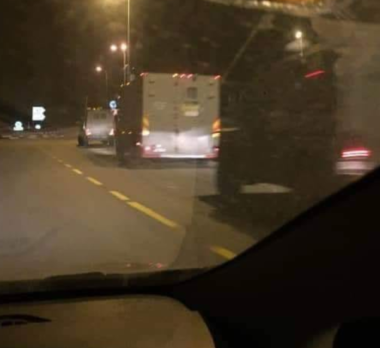 It is worth mentioning that dozens of soldiers invaded the al-Baloa’ area in al-Biereh, on Saturday evening, after a number of live rounds were fired at a bus for colonialist settlers driving nearby. The soldiers initiated extensive and violent searches of homes and stores, and confiscated surveillance recordings and equipment. Israeli soldiers invaded, on Saturday evening, Beit Fajjar town, south of Bethlehem in the occupied West Bank, and completely isolated it. Media sources said many army jeeps invaded the town from several directions, and installed roadblocks on all roads leading to the town. They added that the soldiers stopped and searched dozens of cars, and interrogated many Palestinians while inspecting their ID cards. The soldiers drove around many neighborhoods in the town, which remained closed and isolated at the time of this report. There have been no reports of injuries, or abductions among the Palestinians in the isolated town. In related news, the soldiers closed the iron gate at the Wadi Sa’ir road, north of the northern West Bank city of Hebron, and prevented the Palestinian from crossing. Many Palestinians were unable to drive back to their homes, while dozens of soldiers were also deployed in the area. Israeli soldiers abducted, Sunday, a former political prisoner from the Old City of Hebron, in the southern part of the occupied West Bank. The army invaded several neighborhoods in the city, before the soldiers stormed into and violently searched many homes. The soldiers then abducted a former political prisoner, identified as Omar Abdul-Rauf Abu Sneina, from his home in the Old City. Furthermore, the soldiers installed many roadblocks at main roads leading to several villages and towns, in Hebron governorate, before stopping and searching dozens of cars, and interrogated many Palestinians while inspecting their ID cards. President Mahmoud Abbas arrived in Cairo for a three-day visit on January 4, 2019. He will meet with his Egyptian counterpart Abdel Fattah el-Sisi, and is also scheduled to attend the inauguration of El Fattah El Aleem Mosque and the Nativity of the Christ Cathedral, in the New Administrative Capital of Egypt. On Friday night, President Abbas held a reception at his residence in Cairo. During the event, he briefed a delegation of senior Egyptian media and intellectuals on the latest political developments in the region, especially the US administration’s bias towards Israel by recognizing Jerusalem as its capital and transferring its embassy to Israel. “We are reviewing the Paris Protocol and several other agreements with Israel, including the Oslo agreement and the security cooperation.” The possible result of reassessment is for Palestine to opt out the commitments that are not serving its interest.